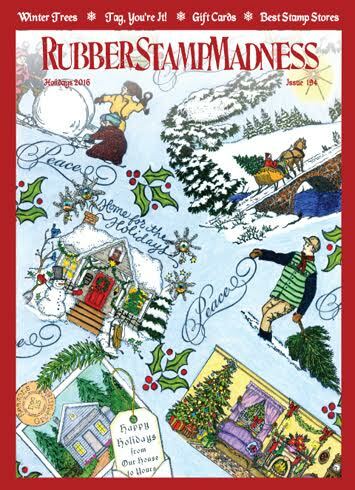 Consider a subscription to RubberStampMadness, starting with the new Holidays issue. You’ll find wonderful Winter Trees stamp art, a how-to feature on Gift Cards & Tags, as well as a Reinker column showcasing cards stamped by three sisters. The Wonders of Winter and The Card Shoppe include additional seasonal cardmaking ideas. The story called Playing with Tags provides technique tips, as well as imaginative ways to utilize this small canvas. The Quick Cards column includes four funny entries by Bibi Lindhal. And there’s more! After the Holidays issue, you’ll receive a Spring issue with a Foodies theme and results of the Cloud-Shape Challenge. Issues and stamping ideas will keep on coming!